This work translates an early journal or account book, dated 1791, describing 62​ ​years of activities on a farm in Dutchess County, New York. This book contains financial transactions from a 220 acre family farm in the Town of Hyde Park, Dutchess County, New York. The first entry is in 1791, and the last 1853. The book was discovered in 1920, during a restoration to the old​ ​Conklin​ ​homestead. ​​His first son, John J Conklin starts the book in 1791 and when he dies in 1803, the journal is taken over by his younger brother, Abraham I Conklin, who keeps it until his death in 1853. The Account book offers a valuable perspective on the farm economy in the late 18th and early 19th century in Dutchess County. The hundreds of names of customers will be of interest to genealogists. The building project offers a unique look at labor rates and cost of materials in 1797 and 1798. A lot of information from a 42 page historical journal. 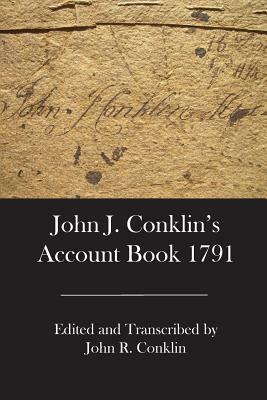 ​"John R. ​'​Jack​'​ Conklin, continues the family tradition of making accessible family history through the sharing of documents (this account book and Capt. John Conklin's Bible entries) and his own writings. The knowledge of the contributions of this branch of the family continues to grow as more information on their varied lives are revealed.​"
​Jack Conklin grew up on the family farm where this account book was discovered. The property was in the Conklin family for 7 generations and 220 years. Located the eastern most part of the town of Hyde Park, the original farm boundaries formed the lines of the Dutchess County Towns of Pleasant Valley, Poughkeepsie and Hyde Park. Jack is a graduate of West Point, Class of 1956, and a retired business man who was President of several local businesses. He has authored articles for the Historical Societies of Dutchess County and Rhinebeck, as well as writing a history column for a local newspaper. This publication makes available, to interested genealogists, the hundreds of names recorded in the 1791 Conklin Farm account book.